Deep sea pictures really help us to visualise what lies beneath the water surface. Luckily, there are many ocean floor pictures taken by some wonderfully exciting photographers. But what do you think you will see in the deep blue sea? Maybe you imagined a scene from Steven Spielberg's "Jaws" movie. Luckily Caribbean scuba diving trips are not as eventful as Jaws but you can see an array of exciting sea life. This deep sea photo was taken in the waters of the tropical island of Utila. Utila is nestled in the Caribbean Sea and located approximately 18 miles (29 km) from the Honduras mainland. Utila is known underwater adventures with over 60 beautiful scuba diving sites and docile, migrating whale sharks. Bahia de Cochinos, also known as the "Bay of Pigs" on the southern coast of Cuba is famously known for the US invasion of Cuba in April 1961. 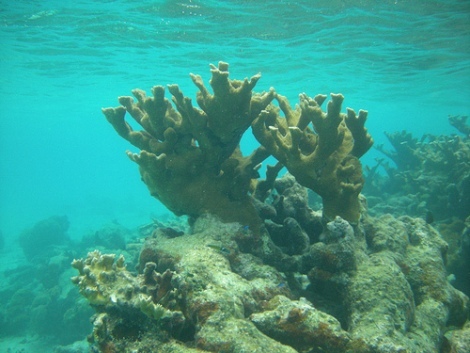 The Bay of Pigs scuba diving site is known for its 30 m swim through and small coral gardens at 6 m. It is commonly populated with barracudas and tuna. There is wonderful diving with 30/40 metre visibility, gorgeous wall dives and large quantities of marine life. 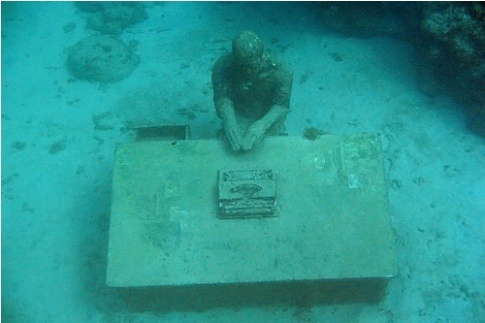 The underwater sculpture "The Lost Correspondent" in Moliniere Bay, Grenada which lies on the ocean floor was created by Jason de Caires Taylor . Just one of a series of sculptures throughout the Caribbean. These works of art can also be found in Mexico. The underwater sculpture shown can be easily seen while snorkeling in 3 - 8 metres of shallow waters at Moliniere Bay, Grenada.